Long rails for roof mount installations are sometimes constructed from two shorter rail sections with a mechanical splice. It is then necessary to also make an electrical splice, which can be done with a WEEB Bonding Jumper as shown. 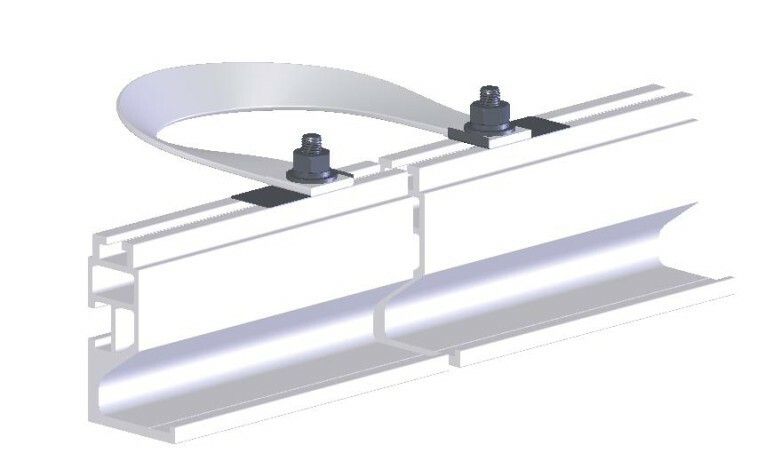 For extremely long rails, the manufacturers generally recommend that the mechanical splice be connected at only one end. This allows for thermal expansion. When installing the electrical splice on spliced rails that require provisions for thermal expansion, install the WEEB Bonding Jumper with some slack in the tin-plated copper braid as shown. WEEB stands for "Washer, Electrical Equipment Bonding". The WEEB family of products are used to bond solar modules to solar mounts. The mounts are then grounded so the entire assembly is grounded. The WEEB family consists of six products (two of which are shown to the right): WEEB-9.5, WEEB-DMC, WEEB-PMC, WEEB-SMC, WEEB-UMC, and WEEBLug. The WEEB-9.5 is used for bonding modules to ground and pole mount systems. The WEEBLug provides a connection to the mounting system and has lay-in provision for an equipment ground conductor. The remaining products are used for rail mount systems. For brevity we use WEEB-xMC to refer to any of the rail parts. The following list shows which part is used for each rail manufacturer. ...No more running ground wire to every PV module. ...Meets UL467 requirements for bonding/grounding systems. ...Patented design features stainless steel teeth that pierce into anodized aluminum, providing a gas tight connection which prevents oxidation. ...Gives more consistent results than the method of scraping off the anodized coating by hand and using star washers. All six products have been tested according to UL467 and are listed with Intertek, a National Recognized Testing Laboratory (NRTL). The products use patent pending technology for bonding anodized aluminum surfaces together. Bonding PV modules to a mounting structure removes the need to wire the modules separately: just the mounting structure needs to be wired to ground. The WEEB-9.5 is a washer used to bond the frame of a PV module to a pole or ground mounting structure. The WEEB-9.5 has fingers which will hold the part in any 3/8 inch hole. This allows the WEEB-9.5 to be inserted at the mounting locations and stays in place while the module is aligned. When the hardware is tightened, specially designed teeth on the WEEB-9.5 embed into the module and mounting structure, making a gas-tight connection. A variant part, the WEEB-9.5NL, does not have the fingers. This allows the part to be used to join structural pieces of a mounting structure where only a single fastener is used and allows bolts up to 3/8 inch in diameter. The fingers are not needed because it is relatively easy to assemble a single fastener with the WEEB, while for the case with modules, the large size of the module would make it difficult to position both the module and the WEEB. See the installation instructions for detailed pictures. The WEEB-xMC(s) are used for rail-mounted modules. Retaining features keep the parts on the rail while still allowing them to be correctly positioned beneath the modules. Rounding out the product family is the WEEBLug, a two piece set of washer plus lug. The washer has specialized teeth for making connection through an anodized aluminum surface. The lug allows the lay-in connection of wire after the lug has been mounted. How Many Parts Do I Use? For the WEEB-9.5NL, make sure two parts are in each conduction path. For example, on a pole mount, each module rail (the structural pieces to which the modules mount) is in turn mounted at two points to a cross-bar. One WEEB-9.5NL should be used at each of the points where the module rail mounts to the cross-bar. Read on to find out about how the WEEB works.